The wedding ceremony itself is usually only a tiny fraction of the wedding day, and yet those 30 minutes or so may be the most meaningful time of the entire day. For many brides and grooms, the emotion and the significance of the ceremony make those wedding photos the most important. The bride's walk down the aisle, the veiling of the bride, the expressions of the couple while they say their vows, the ring exchange, the drinking of wine, and of course the first kiss and breaking of the glass are all important parts of the Jewish wedding traditions. The circling, when the bride circles the groom seven times to represent the seven wedding blessings and seven days of creation is another important tradition. So is the signing of the Ketubah, the Jewish marriage agreement, which is signed by the groom, the rabbi, and two witnesses. The Ketubah is a lifelong contract to be honored by the couple. Because it is such an important document, many couples choose a ketubah that is also a beautiful customized work of art they can display in their home as a prominent reminder of the their commitment to each other. 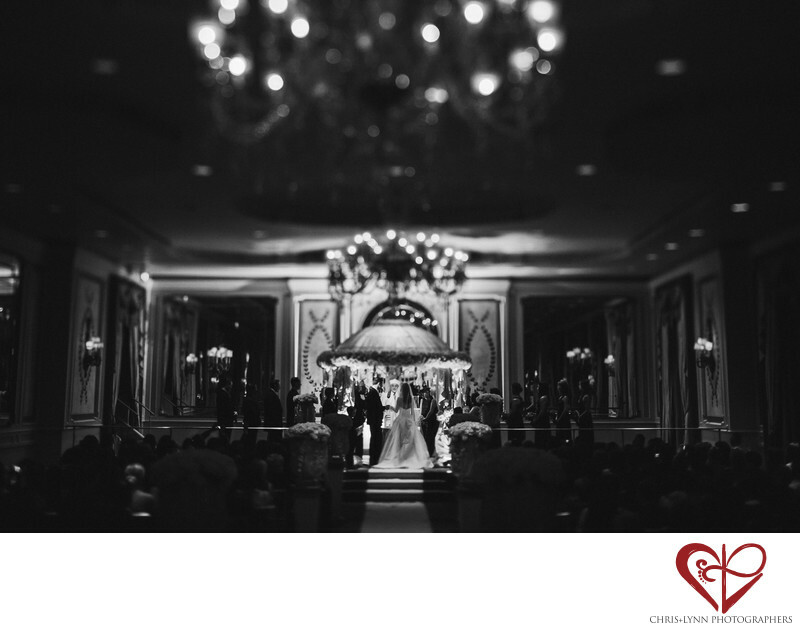 This image of a Jewish wedding ceremony takes place at The Plaza Hotel in NYC, one of the most exclusive venues in Manhattan. The photo was taken with a Canon 45 mm tilt shift lens to add to the dreamy ambiance of the the setting. Location: 768 5th Ave, New York, NY 10019, USA The Plaza,. 1/60; f/2.8; ISO 800; 45.0 mm.